Pao de queijo (cheese bread) is a very popular snack / breakfast bread of Brazil. It is available in all the coffee shops, restaurants, eateries and people prefer having it with coffee at any time of the day. This is a very light, fluffy and cheesy bread usually made in small bite size rolls and also one of the easiest breads one can ever make. No rising and fermenting is required. It expands during the baking because of the elasticity of the starch from the cassava flour and cheese content in the dough. Pao de queijo taste the best when are just out of the oven freshly baked and crisp. They soften a bit after some time but still can be relished after warming them a bit. 1. In a pan combine the milk, water and oil. Whisk it and bring to a boil. Reduce the heat and add all the tapioca / cassava starch to it stirring briskly. 2. Remove it in a large bowl. 3. When it cools down a bit and you can handle it , add the egg, grated cheese and salt. Knead it well until everything is well mixed. The dough is usually a bit sticky. 4. Take a small portion of the dough, Roll it to make it smoother and place it on a greased baking tray. You can rub some oil on your palms to make it easier. Repeat this until the dough is used up. Leave enough space in between as the breads expand on baking. 5. Bake them for about 30 minutes or until they are golden and crispy at - 180 C (350 F) temperature. Please note that the baking time may vary according to the size and type of oven. So keep checking. This quantity makes about 15 - 18 breads depending on the size you make. This is new to me. But looks so soft and delicious. I am sure it tastes good too. 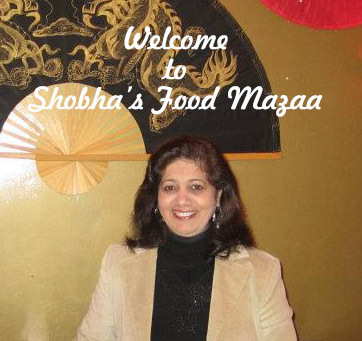 Your Brazilian Cheese Bread looks so light and delicious, Shobha! What a gorgeous breakfast bread! Thank you so much for sharing it with us at the Hearth and Soul Hop. Thanks for liking it April.. It is really nice and fluffy.Perfect tea time bread. I'm glad you shared a Brazilian recipe with us. Never thought that a bread could be made from cassava starch. Thank you for sharing the recipe. Thanks mayuri.. and it is the most easiest bread I have ever come across.. I have tried these Brazilian cheese bread. Just loved it. Your clicks look tempting. Sure Donna... most of the recipes in Brazilian cuisine are very easy to make ..